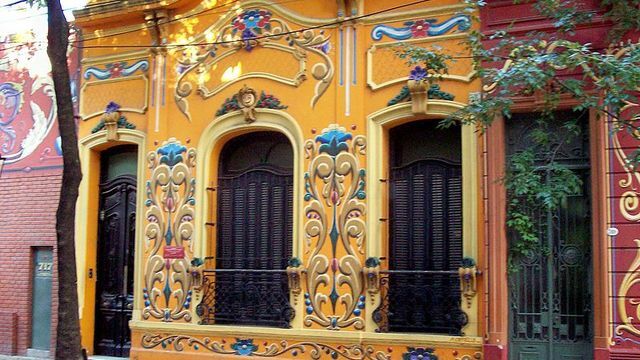 Discover the architectural jewels of Buenos Aires that most tourists miss. In this distinctive walking tour, first we will connect some unique spots that are not in the touristic circuit. Then, you will enjoy discovering the jewels of a neighborhood (not listed in guidebooks) that you would never have the opportunity to explore without knowing a local. The second most-beautiful book shop in the world: an old theater that was converted into a book shop. A prominent British periodical named it second in its 2008 list of the World's Ten Best Bookshops. Just stepping inside this former grand theater will take your breath away. The area of Carlos Gardel – the most famous tango singer in history. House facades and shops covered in “fileteado” artwork. A creative art, one-of-a-kind, full of vivid colored ornaments and symmetries. 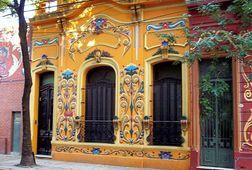 The style of painting associated with Buenos Aires that has much to do with tango and that have been part of the culture of the Porteños (inhabitants of Buenos Aires) since the beginnings of the 20th century. Also, expect to view creative street art and murals painted by local artists, a tango clothes and shoes store, etc. for a most memorable experience. Availability: Tours run every day (except on some holidays). Morning tour starts on or after 10:00 a.m. Please message me before booking to confirm availability.